TOKYO, Jan 18, 2019 - (JCN Newswire) - The 2019 FIA World Rally Championship season kicks off on January 24-27 with one of the most demanding events of the entire year, the famed Rallye Monte-Carlo. 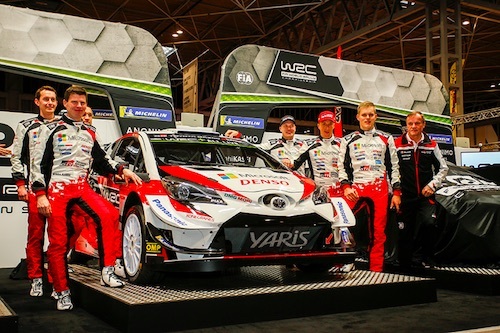 The TOYOTA GAZOO Racing World Rally Team, with its fast and experienced driver line-up of Ott T?nak, Jari-Matti Latvala and new signing Kris Meeke, will look to make the strongest possible start to its defence of the manufacturers' title it won in 2018 and its fresh assault on the drivers' and co-drivers' crowns. Rallye Monte-Carlo is notorious for its difficult and changeable weather conditions, which can vary from dry asphalt to snow and ice--often within a single stage. This makes tyre choice a critical factor throughout the event, with drivers reliant on their ice-note crews to provide them with information on the latest stage conditions. The rally is based for much of the event in the French town of Gap, which will host the service park and the start on Thursday evening, before the opening two stages are run in darkness to provide a tricky start to the competitive action. Friday is the longest day of the rally, with two loops of three stages south-west of Gap. Saturday has two stages both run twice before a long drive into Monaco ready for Sunday, which takes place over a pair of repeated tests in the nearby mountains and includes the iconic Col de Turini. "We are feeling very excited to start this new season. We have a change to our driver line-up, with Kris joining the team, and there are some big changes among the other teams as well, so it is going to be very interesting to see what happens in Monte Carlo. Of course, it is a very tricky event to begin the season with, but our drivers have a lot of experience there. This is maybe the most important thing, as my success there came in my final years as a driver. We go there feeling very positive as a team: Ott is now very at home in the car compared to one year ago, while Jari-Matti had a really strong end to last season and Kris has felt immediately comfortable with the team and the car." "I am feeling much more relaxed heading to Rallye Monte-Carlo this year. Twelve months ago, everything was new for me, but now I am going into the season with the same car and the same people and I believe that we are a really strong team now. All of the knowledge and experience we gained last year will only make us better. Personally, I am hungrier than ever, after having come so close in the championship last year. We know that we just need to be smart, particularly on an event that is as unpredictable as this one. Second place was a great result on the Monte last year and it would be nice if we can go one better, but we are up against some really strong opposition." "Together with my co-driver Miikka, we are about to start our 13th full season in the WRC. There is still a lot of motivation to fight for rally wins, and maybe the drivers' championship too: this is still the ultimate dream. The second half of last season was really good for us and if we can continue that trend then we should be right up there. We know the car is reliable and fast, so it is up to us drivers to get the most out of it. I have finished on the podium in Monte Carlo in both of the last two years with the Yaris WRC and it would be ideal to keep that run going, but the key is to have a clean weekend and minimise the mistakes." "I am really excited to get going with what is a new start for me, with a new team, a new car, and even a new co-driver. What the team was able to achieve last season, particularly in the second half of the year, gives me a lot of confidence in the car that I am going to have underneath me. Driving the car myself, I have been impressed by what it is capable of. I am still learning though, so I am not setting any big targets for Rallye Monte-Carlo. My immediate priority is simply to enjoy driving again, and the Monte is certainly an event I have enjoyed in the past." The team enjoyed a great start to the 2018 season in Monte Carlo with a double podium finish. Ott T?nak came second in his debut in the Toyota Yaris WRC, already challenging for victory. Jari-Matti Latvala returned to the podium in third. Esapekka Lappi also showed a strong performance in the third car, holding fourth place until a small mistake on the final stage moved him down to seventh.